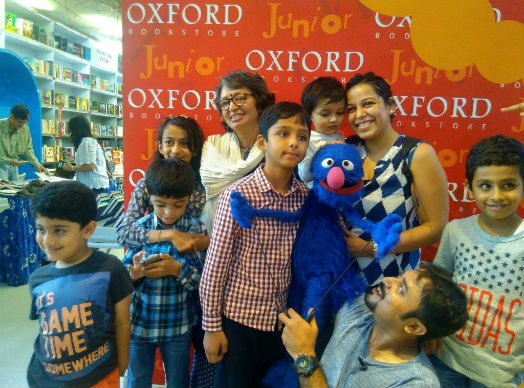 New Delhi, September 23, 2017: Sesame Workshop India and Oxford Junior organised a fun session at Oxford Bookstore, Connaught Place in Delhi today. The children enjoyed a session of story-telling by renowned children’s book author Deepa Agarwal, followed by a quirky and captivating performance by Grover from popular kids’ TV show Galli Galli Sim Sim on the theme ‘Kindness’. Deepa Agarwal mesmerized the young audience with her story-telling where she narrated the story of The Toy Horse, Lippo Goes To The Park and Caravan to Tibet. Her book-reading session was followed by an engaging act by Grover focusing on important life messages to help children understand and practice kindness. Deepa Agarwal has written about fifty books for children ranging from mystery and adventure novels, ghost stories, stories of everyday life, picture books and biographies, retold folk tales and myths, and compiled textbooks. Leading publishers like Scholastic India, Puffin Books India, Children’s Book Trust, National Book Trust, Ratnasagar, Rupa & Co., Frank Educational Aids and Vikas have published her work. Her series of picture books with titles like Lippo Goes to the Park and Squiggly Goes to School, published by Frank Educational Aids is one of the most widely circulated series for children published in India. Deepa has won several awards in the Children’s Book Trust Competitions for Writers and five of her books have been listed in the White Raven Catalogue of recommended books brought out by the International Youth Library, Munich. She received the N.C.E.R.T National Award for Children’s Literature for her picture book Ashok’s New Friends in 1992-93. Caravan to Tibet was on the IBBY (International Board on Books for Young people) Honour List 2008.